Hong Kong's leader Tung Chee-hwa has denied that China's President Hu Jintao has criticised him for poor governance. At celebrations to mark five years since neighbouring Macau's handover to China, Mr Hu told Mr Tung he should raise his administration's abilities. In contrast, Mr Hu praised the "great improvements" which had taken place in Macau since it became part of China. But Mr Tung denied he had received a public dressing-down, insisting he had the president's full support. The difference between President Hu's admonishment of Mr Tung and the praise he heaped on his opposite number in Macau, Edmund Ho, could not be greater, according to the BBC Hong Kong correspondent Chris Hogg. Mr Hu congratulated Macau on the success of its "one country, two systems" formula, while urging Hong Kong's administration to improve its governance. But the Chinese president made no mention of Taiwan, for which the "one country, two systems" formula was devised. 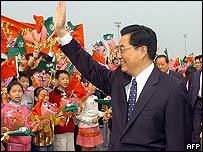 Mr Hu said Macau's return to China had brought "great improvements" including extensive freedoms and democratic rights. "Under the government of Chief Executive Edmund Ho... it has overcome the Asian financial crisis, external economic changes, Sars and other challenges," Mr Hu said. He was less positive about Hong Kong. As he joined Tung Chee-hwa and his ministers for a photo-call, Mr Hu said the group should reflect seriously on what Hong Kong had gone through while implementing the "one country, two systems" formula. "You should summarise your experience, look for shortcomings and constantly raise your governance ability," Mr Hu told the assembled ministers. In a press conference in Hong Kong, after his return from Macau, Mr Tung played down the Chinese leader's comments. "I hope I don't disappoint you again by telling you it was not a dressing down," he told reporters. "We had a very good meeting. He was very supportive of the work we've been doing, and he thought that the development in Hong Kong was positive," Mr Tung said. According to our correspondent in Hong Kong, it is not hard to see why Macau should be praised by China, while Hong Kong is criticised. 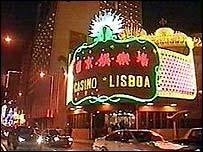 Macau - which has always been more pro-China than Hong Kong - is enjoying a boom, fuelled by the expansion of its gambling industry. Though improving, Hong Kong's economy has been hit hard by a number of crises, the most recent being an outbreak of Sars last year. The territory's people have taken to the streets twice in huge numbers in the last 18 months in protest at unpopular government policies. There is also an ongoing row over how best to choose a successor for Mr Tung when he steps down in three years time. Where next for HK's democracy?